While the weekend is a perfect time to relax and recover from the previous week, it is also a great opportunity to set yourself up for the week ahead. It is a time to plan and prepare and set yourself up to save time during the week. I've put together a list of my top things to do at the weekend to make the week ahead healthier for yourself. I am a big fan of meal planning, and always sit down on a Sunday to roughly plan what I want to be eating for the week ahead. If you are looking for ideas, you can use my healthy meal plans to get you going.. I also have loads of breakfast, lunch and dinner recipes to help inspire you. I find it really helps to write it down in a diary or food planner. I always start by having a few meal ideas in my head, and then work backwards to fill out the rest of the meals. Once you have set out your meal plan, go through the cupboards and get together anything you need. It's always easier to stick to healthier options in the shop when you are following a pre-made list. Try separating the list out into different sections to help make things easier to find, like meat, dairy, fruit & veg. Try and plan for 2 exercise opportunities. This could be anything from going to the gym to having a short walk around the area that you live. 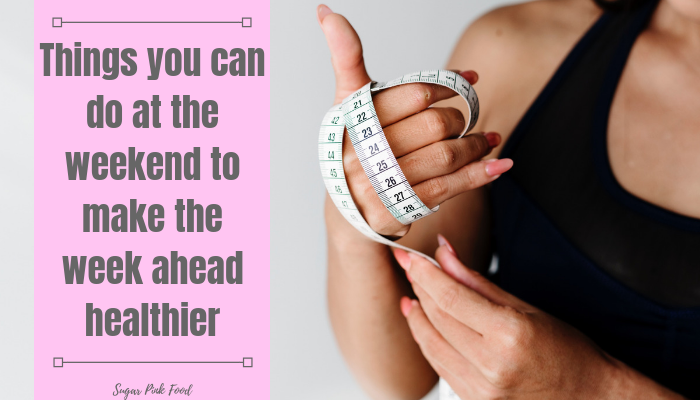 You are much more likely to stick to it if you have it planned out in your head before hand. Exercise is not only great for the body, but great for the mind as well. Even something as simple as walking to the shop instead of driving (depending on the distance!) can be a help. I am a big fan of prepping my meals ahead of time, as it saves so much time during the week. You can put all the ingredients in together for the meal, and cook either in the slow cooker or the oven. 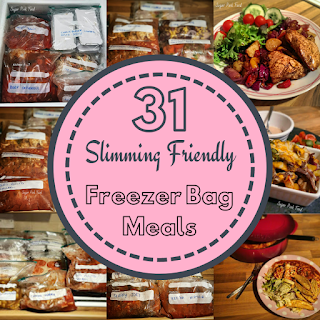 You can also freeze them and make as many as 31 meals in one batch. If you have to take lunches to work, then spend Sunday night at least making your lunch for the next day. It saves time in the morning and helps you to be fully prepared with a healthy option instead of grabbing something on the go. I have shared some great take to work lunches on before, such as salads and crustless quiche. Try to find the time to really relax and unwind. Even if it is just to grab a bath to yourself, to paint your nails or to stick a face mask on. I love m Sunday baths, I listen to music and really try and chill and relax so that I get a good nights sleep. It is as important to relax as it is to plan and prepare. What tips do you have for preparing for the week ahead? Let me know in the comments. Yeah some good ones do most of them already as you say they work very well, always good to think a head if you can and pick meals you would like to prepare. I remember back in the day when I used to be so organised on the weekends. But I still batching cooking which is great.